As of April 19, Mariano Rivera stands atop baseball's career saves list with 606. He's also the last active player with uniform #42, grandfathered in for those who wore it prior to 1997's league-wide retirement. Thanks to this longevity, Mariano's number also matches his age, a distinction Jamie Moyer will share when he turns 50 later in 2012. 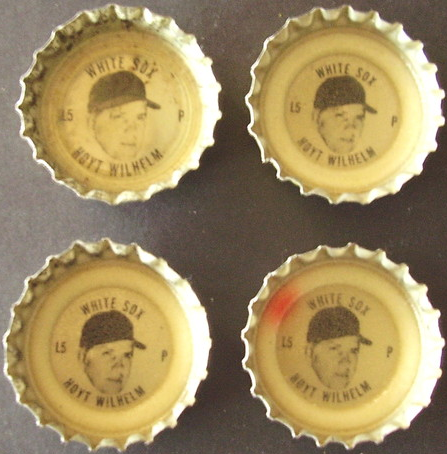 Coke produced bottle crowns for a bunch of teams in 1967-68, one of the players union's first big endorsement deals. 1967 includes the player position (P for Hoyt), which 1968 omits, but he's White Sox #5 in both years. The blacked-out caps indicate no agreement with MLB Properties, who own the team logos, though 1960s card collectors also saw them when Topps showed a player on a new team they don't have a "real" picture for. Wilhelm changed teams so often, it happened to him more than once. I mention Mariano as a modern parallel to Hoyt Wilhelm, the first pitcher to make 1000 appearances and receive Cooperstown induction as a relief specialist. It surprised (shocked?) me to learn Hoyt didn't start in the majors until age 29--thanks to WWII military service--and still broke four digits. 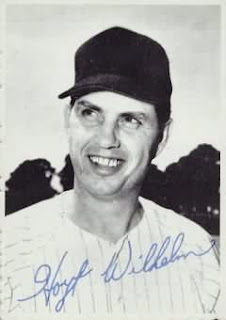 Like Rivera and Moyer, "Old Sarge" Wilhelm briefly wore his age (#47) as an Atlanta Brave in September 1969 (career stats and uniform numbers). Hoyt's closest contemporary was Lindy McDaniel, a 21-year vet who also played for several franchises and finished 13 appearances short of 1000. We'll give some extra respect to Mariano for spending his whole career with one team. All four of these brands remain on store shelves today. 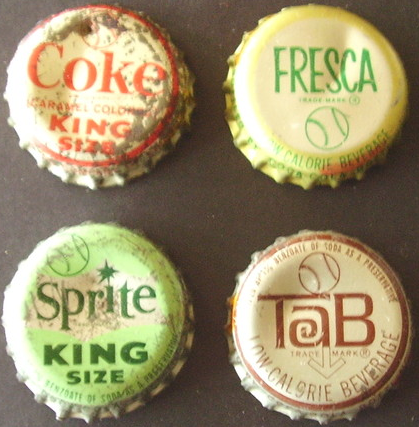 Tab served as Coca-Cola's diet cola before there was Diet Coke, mostly to compete with RC Cola's Diet Rite brand and target women specifically. Its body-image-heavy 1967 slogan: "Be a Mindsticker." Value: This 4-cap combo's priced at $32 on eBay. Seems high to me, but it'd be a challenge to gather all four brands for one player in any grade. Fakes / reprints: Doubt someone could make any money faking Coke caps, given the required plastic liner and stamping equipment. Dang, Hoyt looks like Steve Buscemi. Then is this site also relevant to your interests?